Have you ever had the dream of participating in a Big Year? I have, but I probably won’t be able to fulfill my dream until later on in life. But until then, I have been reading a wonderful blog about four Calgarians participating in a Canadian Big Year for both birds and mammals. The blog is Fur & Feathers 500 – a Canada Big Year for Birds and Mammals. There are some beautiful photos in this blog and wonderful posts about their journeys across Canada. I would recommend subscribing to their blog to get regular updates on their progress and lists. I hope by the end of 2012 Brian, Ray, Phil, and Mike are able to achieve their goal of 500 species of birds and mammals! This entry was posted in Alberta Animals, Autumn, General Birding, Spring, Summer, Winter, Year List and tagged Big Year, Canadian Big Year, Pine Grosbeak. Bookmark the permalink. Thanks for telling us about the site. It’s an exciting blog and I’m anxious to follow their adventure. 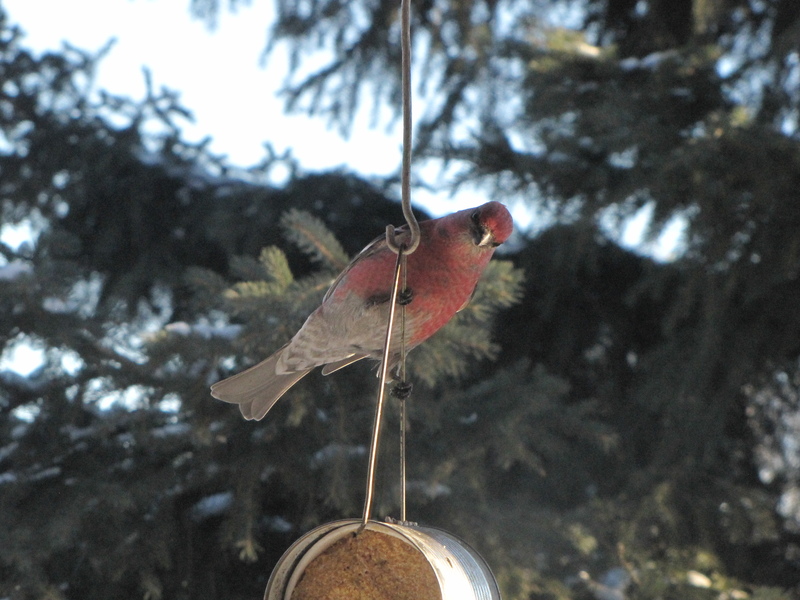 A very nice photograph of the Pine Grosbeak. I’m glad you like my grosbeak photo Gene.